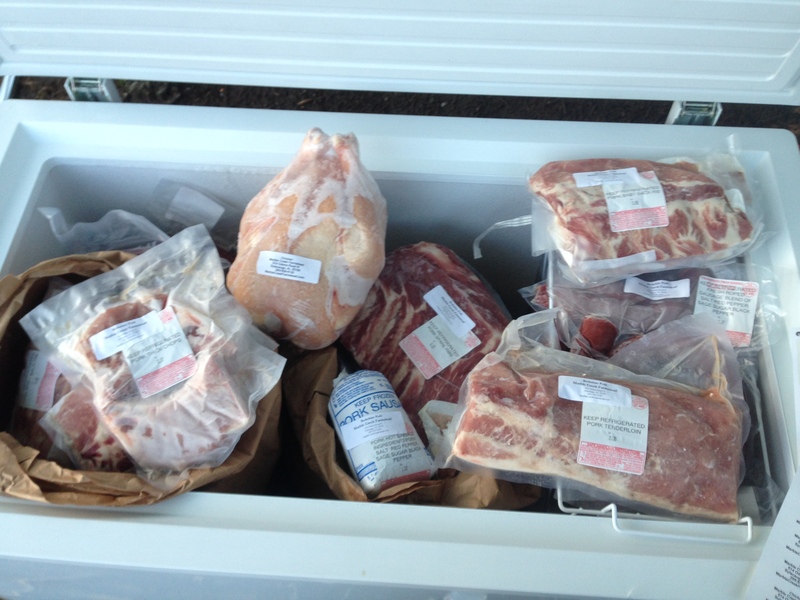 Announcing the Marble Creek Farmstead Pastured Meats CSA! 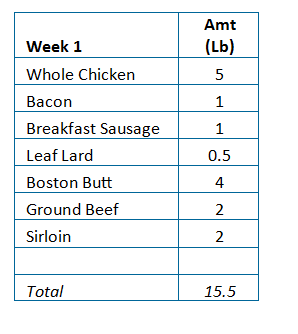 We are now offering a limited number of shares for our meat CSA. Community Supported Agriculture (CSA) is a relationship between our farm and you as our customer. Rather than simply purchasing food, our customers become “members” of this CSA farm who receive a portion of the farm’s harvest. The upfront capital allows us to invest in fencing, new animals, feed, processing costs, more land, etc. while ensuring you have a reliable and regular source of the healthiest meat around. We will set up bi-weekly pickups at convenient locations in downtown Birmingham, Hoover, and 280. 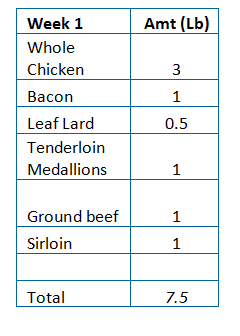 The chart below outlines some of the meats we hope to deliver and when you may see them in your share. This chart is based on our best estimate, but of course, growth and production may vary. Meat comes hard frozen. We raise heritage breed pork (Berkshire, Large Black, and Tamworth). They are raised on rotating 1/2 acre paddocks. We move them often to ensure they are on clean, nutrient-dense pasture. They are given a non-GMO feed from a local company. We raise traditional (Cornish cross) chickens as well as Red Rangers, Pioneers, Barred Rocks, and Heritage Whites. They are raised in large chicken tractors. They get fresh pasture every day (or even more often). We carry beef from Hurricane Branch Farms, a nearby neighbor farm that raises heritage British White cattle. They have never been bred to do well on grain, so the 100% grass-fed flavor is the best possible. Some people raise grass-fed beef with commercial breeds, but they don’t taste as great as the heritage breeds when raised on grass, in my opinion. We never use growth hormones, insecticides, feed-based antibiotics, etc. The family share is designed to provide 2-3 breakfasts, 4-6 meals, and a cooking fat of some kind (we will help you learn what to do with those). The single/couple share is designed with smaller packaging more appropriate for your meals. The chickens are smaller and the share forgoes roasts. 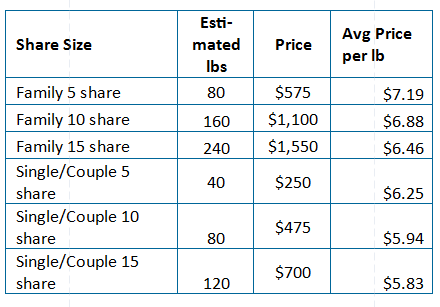 These shares should have 1-2 breakfasts, 4-5 meals, and a cooking fat. The CSA will begin around October 15th. The final pick up locations and dates will be sent out later next week. They will typically be on Tuesday, Wednesday, or Thursday from 5-7 pm. We will deliver your share bi-weekly. So a 10 share will run 20 weeks, a 5 share will run 10 weeks, etc. You also have the option to come pick up your share at the farm and see how we do everything, just let us know ahead of time. If you are interested in buying a share, I encourage you to do so quickly. We are about 70% full currently and expect to fill up quick. To do so, please email marblecreekfarmstead@gmail.com and tell us which type of share you want. If we have space, we will email you to go purchase it in the online store. Feel free to call Matthew at 205-936-6120 with any questions. If you are not ready to buy now but want to be kept informed about when new shares become available, please let us know as well.